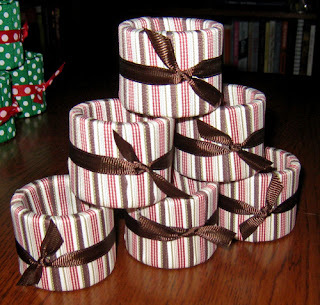 I am so excited to have completed my first project from the BPC Giving Well workshop - ribbon covered napkin holders. I knew as soon as I saw the photo that I would be making a set of these for myself. I love setting a nice table and using our cloth napkins and placemats and china and silverware, so this project was perfect. I started by creating a set of 8 napkin holders to use at Christmas time. 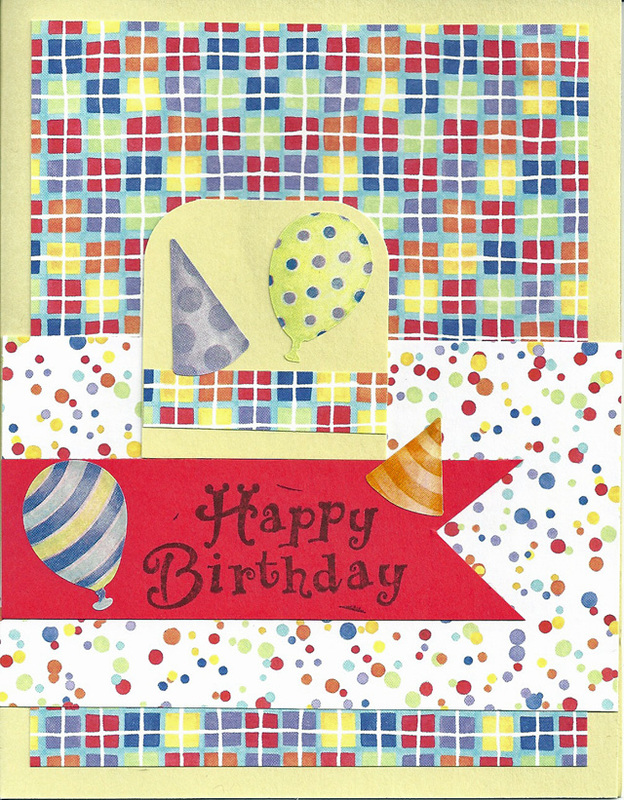 The red and green polka dots simply make me smile. The holders are made using PVC pipe, hot glue and ribbon. I made the first set 2" tall, then decided to try another set at 1 1/2" tall. 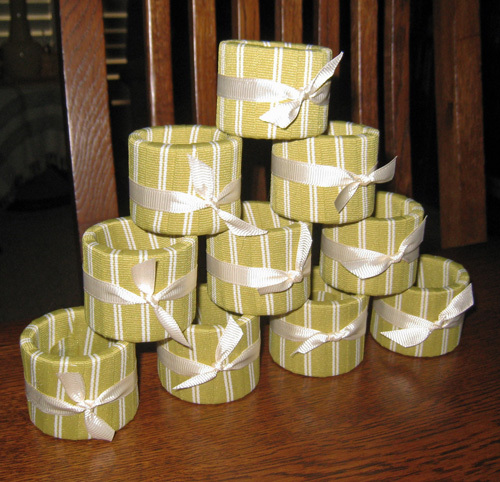 I used some green Stampin' Up ribbon that I've had in my stash for several years for this set of 10. 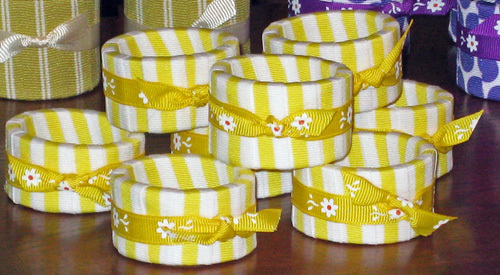 In all honesty, the reason this ribbon has been in my stash is that I didn't like the color and couldn't find a use for it. 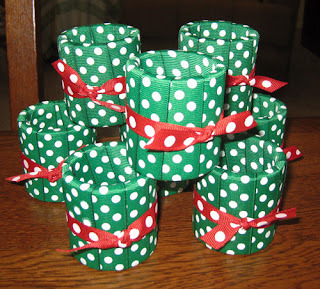 However, I really like the way it looks made into napkin holders that can be used year round. Next I decided to create a couple of sets as gifts for friends. (Wasn't it lucky for me that Hobby Lobby had all their ribbon on sale for 50% off last week!) I made a set of 8 purple holders for one friend and a set of 6 striped holders for a Christmas gift for another friend. These are also 1 1/2" tall. 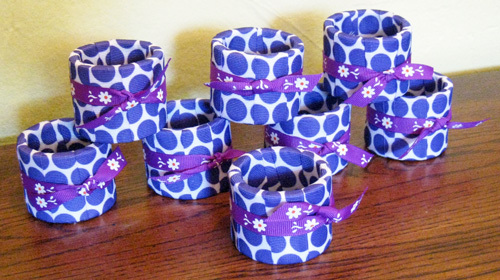 And finally, since there was 8" of PVC pipe left, I made a set of 8 one-inch holders for me in my favorite color. Every time I completed a set, I decided that was my favorite one! I really like the way they all turned out and am looking forward to using these and giving them as gifts. Which ones do you like best? BTW - The Giving Well workshop provides step-by-step directions for 14 handmade gift ideas and registration is open until November 3. Check it out! Your layout is great! The flower is just perfect. I usually add texture to my layouts by tearing paper and also adding ribbon and buttons and so on. Would love to read this book, it looks really interesting! Becky, please email me at robbieandmelissa (at) sbcglobal (dot) net with your mailing address and I'll get this book on its way to you! Shimelle encouraged us to "Start Big" when we began using our homemade kit, however I forgot that advice and started small, with a single page layout and one photo. Then I remembered the directions and decided to create a two page layout with my kit next. I started with my photos and inspiration from one of the Double Take sketches. I did add a couple of brads that were not part of my kit to complete this layout. 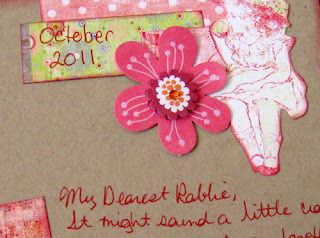 I started with the prompt 5 sketch and two photos of Robbie for this next layout. These photos were taken at his new job because they needed a photo to add him to the company website. 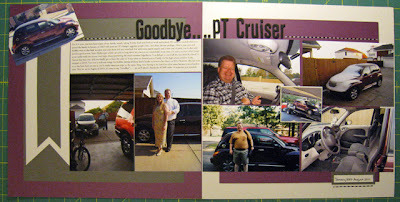 Everything on this layout came from my Stash Diving kit with the except of the white cardstock I used to mat the photos, which I pulled from my scraps file. 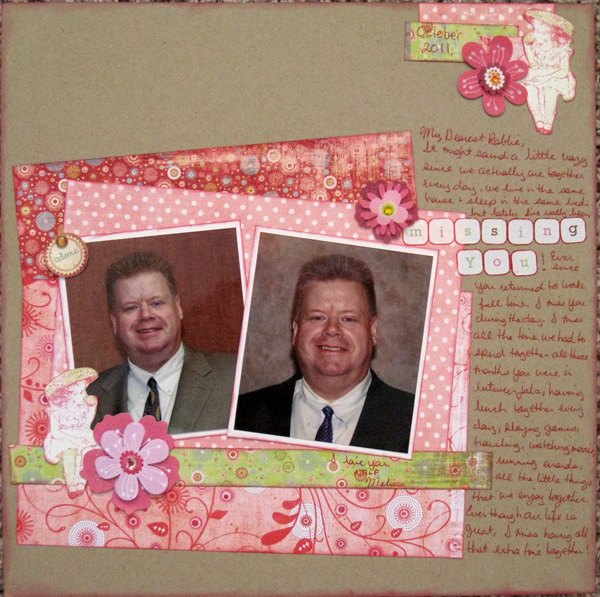 I tried something new on this layout and cut a picture out of one of the pieces of patterned paper to use as an embellishment, an idea that Shimelle talks about in one of the handouts. This little girl made me think of sitting and waiting for Robbie to come home from work each day. 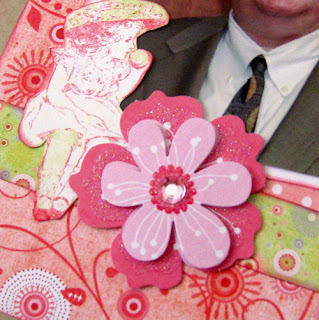 I included a second cut out on the layout in a diagonal with the first, another technique Shimelle emphasises that will help tie the entire layout together. 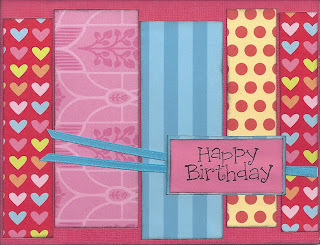 I still have plenty of papers and embellishments left in my kit for a few more layouts and maybe a card or two. ﻿I'm hoping to find time over the next few days to finish up with this kit. 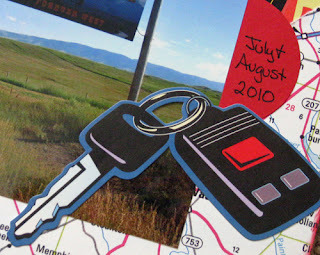 It's time to start the October Pass the Book:Year Two book on its journey. (If you're new to Pass the Book:Year Two, check out all the details here.) 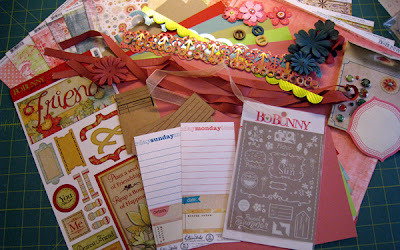 Tantalizing Textures: Ideas and Techniques for Scrapbookers by Trudy Sigurdson is filled with inspiration and ideas for adding textures to your layouts and other projects using textiles, metals, natural elements, art mediums, paper and clear elements. There are tons of layout ideas and examples. ﻿And examples of various craft projects including cards, album covers, and other altered items. Following along with prompt four at the Pretty Paper Party, I created a layout using stripes and dots. I used four patterned papers and a few strips of solid cardstock for this layout plus four different sizes of ric rac and a sheer ribbon. Once I'd added my title and the embellished flower, I decided it looked complete and didn't need further embellishment. What do you think? 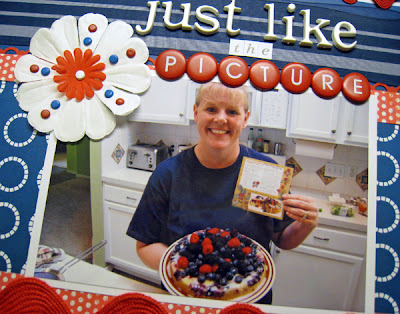 Journaling reads: You just gotta love it when you try a new recipes and it looks just like the picture in the magazine and tastes even better. 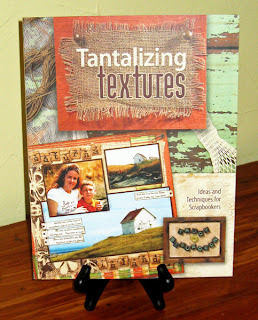 If you'd like a chance to be the first recipient of Tantalizing Textures, please leave a comment telling me how you add texture to your pages. I'll post the winner on Friday. Shimelle's 3rd prompt at the Pretty Paper Party was quite challenging. It involves gathering some pretty patterned papers and then adding items to create our own kit. Then we are to cut up most of the patterned papers into smaller pieces BEFORE we ever start working on a layout. Yes, you read that right - cut it up first! 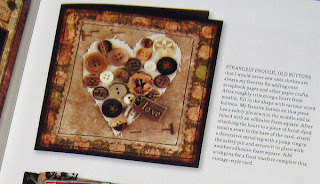 She shared with us the video from her True Scrap session on Stash Diving where she demonstrated the whole process and then created layouts until the kit ran out. At first I wasn't sure if this challenge was for me as I have only once or twice used a kit, but I finally decided to take the challenge. 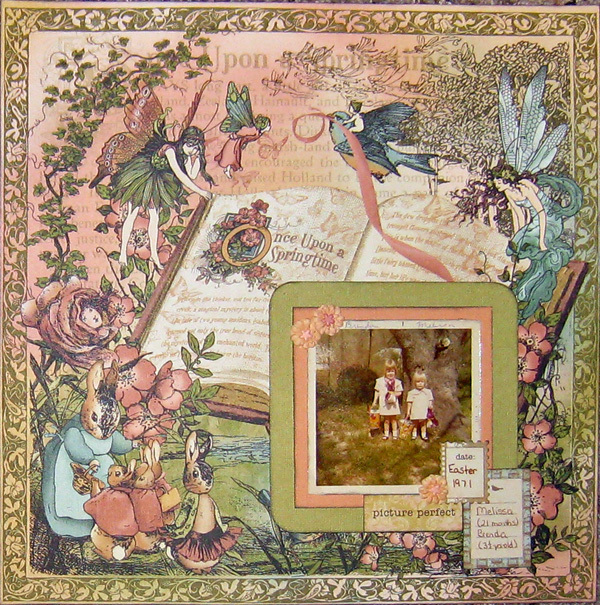 I cheated a little because I had a kit that I had purchased for half price about a year ago at our local scrapbook store. The kit was for a mini-album, however I'd already pulled the album out to use for another project. 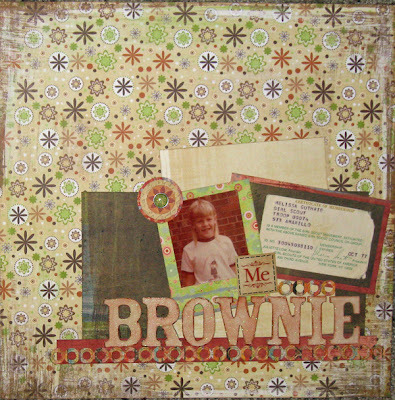 I'd left the papers and embellishments together thinking I would either use them together or at some point merge them into my stash. This was the perfect opportunity to use it, so that was my starting point. 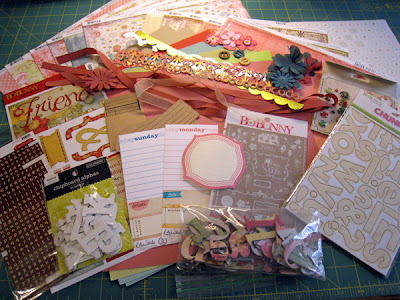 The kit contained 11 Bo Bunny patterned papers which set the color palette for my kit. I actually ended up with 12 patterns since all these papers are double-sided. 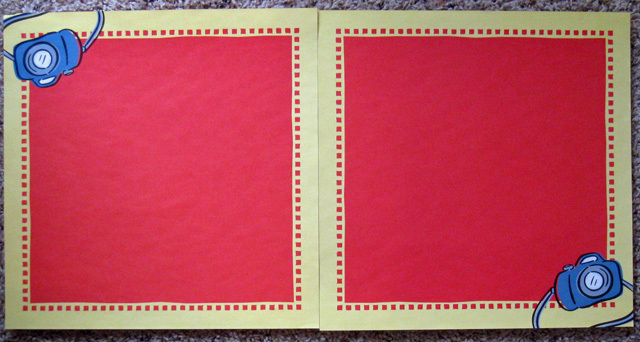 I then pulled 8 pieces of cardstock to coordinate with these papers. The kit had come with one package of Bo Bunny Chiffon Chunky Chips alphas. I pulled several additional alphas for my kit. 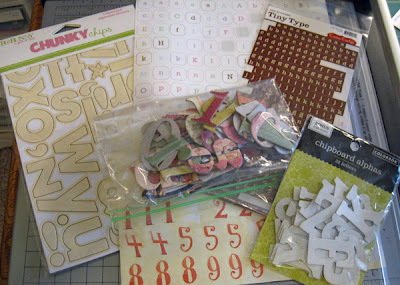 Shimelle actually encouraged us to simply choose two alphabet packs for our kit, but the extras I chose were already partially used, so I have more than that. For embellishments, I started with the cardstock stickers, rub ons, ribbon and buttons that came with the kit. I added several border strips, a few flowers, a 1/2 used package of My Mind's Eye brads, journal spots and labels. Here's a look at the entire kit together. I have to admit that I'm not sure how great of a job I did. I've seen quite a few scrappers who are inspired by the monthly Counterfeit Kit Challenge and have often contemplated joining but have been intimidated by trying to match up my supplies. The hardest part is that I normally (ok, practically always) start with my photos, then choose papers and embellishments to go with them. Starting with a kit is totally different. 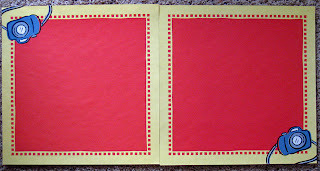 The final preparation step was to cut up the patterned papers. 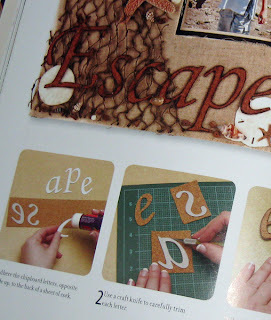 This was also a little challenging for me because I don't normally cut my papers until I've decided on my design and am laying it out on my craft table. But, I decided to trust Shimelle, and just this once, follow the directions. Here's a look at my cut up pieces. What? You don't think that looks like enough pieces for 11 12x12 pieces of patterned paper? Well, you're right. I only cut up six sheets. 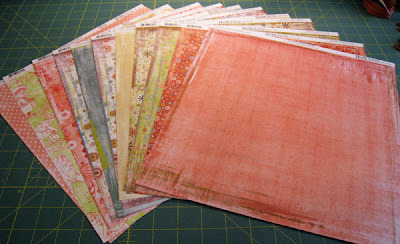 The other five I left whole to use as possible backgrounds or for creating embellishments. Then it was FINALLY time to scrap. 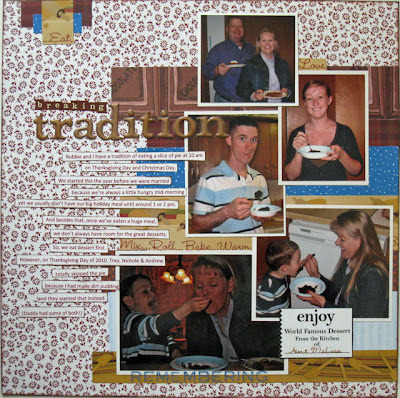 I flipped through my oldest storage binder and decided to scraplift one of Shimelle's sketches from prompt 3 that used only one small photo. I used one photo plus one piece of memorabilia for my layout. I was determined to use only items from my kit, therefore I had to make a few adjustments. I didn't have any letter that I liked for the title. The white glittery chipboard letters were the perfect size, so I inked over them with an off-white/tannish ink and glued them down. But, they were too light and kind of got lost in the layout. I decided to trace around them with a marker, which looked great except that the marker didn't dry so there were smears. I improvised by then intentionally smearing the ink after I had traced the letters, and I am actually delighted with the resulting color. There was one other small problem - did you notice it? Since I had already used some of the letters from this package, there was no "R". I actually used a "P" and cut the leg off the "X" (a letter I rarely use!) and made my own "R" - what do you think? In all honesty, I enjoyed the challenge of using just the items in my kit and am looking forward to creating several more layouts with these papers. This thought was shared in one of those forward-it-to-everyone emails, so I'm not sure who originally wrote it. Just thought I'd share it with y'all now that some cooler weather has arrived here and I can truly say that fall is in the air. Being a Christian is like being a pumpkin. God lifts you up, takes you in, and washes all the dirt off of you. He opens you up, touches you deep inside and scoops out all the yucky stuff – including the seeds of doubt, hate, greed, etc. Then He carves you a new smiling face and puts His light inside you to shine for all the world to see. Have you heard about In Good Company? 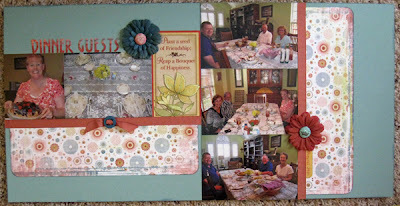 Susanne is inviting everyone to join her in using up some stash by focusing on a particular manufacturer each week. It sounds like fun, but there's one little problem for me. I really don't pay that much attention to who manufactures a product, I simply choose items that I love. However, when she issued this week's invitation to join her using some Graphic 45 products, I decided to flip through my specialty paper file to see if I might just find a piece of paper that had that little strip across the bottom telling me it was from Graphic 45. Luck was with me! I found this beautiful paper that Robbie picked up for me a while back. Some of you are probably asking yourself the same question I've been asking every time I pass over this paper in my stash - how do I use such a beautiful piece of paper? There's so much detail and the page is absolutely perfect all by itself. This is exactly one of the issues that Shimelle has been discussing at the Pretty Paper Party, and she reminds us that if we use that paper and put it in our scrapbook, we will be able to enjoy it every time we look through our layouts. 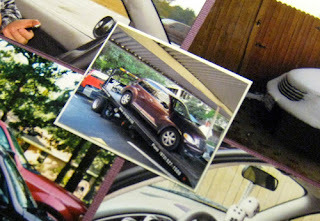 So, I took the plunge by adding one small photo from the storage binder that houses my childhood photos. This Easter photo was perfect for the Once Upon a Springtime paper. I added a small cluster to the bottom right of the photo so I could include the date and our ages. I still think the paper is absolutely beautiful and now it's ready to follow the Journey of a Scrapbook Layout until it reaches its final destination in my childhood scrapbook. 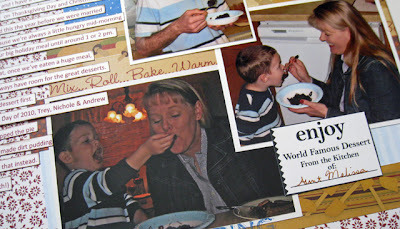 The countdown continues over at Life Behind the Purple Door where I am guest posting today to share one of our favorite cookie recipes. (Check it out here.) Cate has been sharing ideas and inspiration for getting ready for Christmas since September 16, counting down the 100 Days to Christmas. Have you noticed all the inspiring videos popping up lately? Today I want to share links with you to some of my recent favorites. 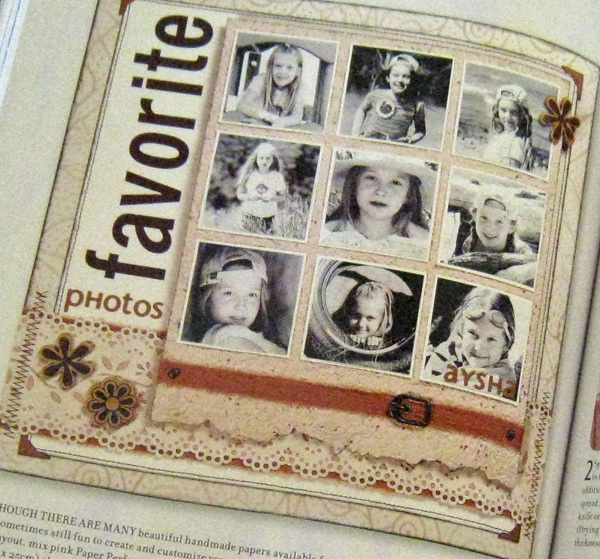 If you've been reading my blog for a while, you've probably seen some of my Photo Album Scrapbooks, an idea I first learned from Stacy Julian when I set up my Library of Memories system. 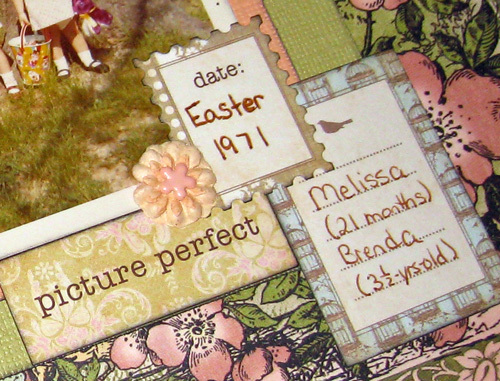 Stacy shares several of her albums and the process to create these fun keepsakes in a recent My Craft Channel episode - Photo Album Scrapbooking. 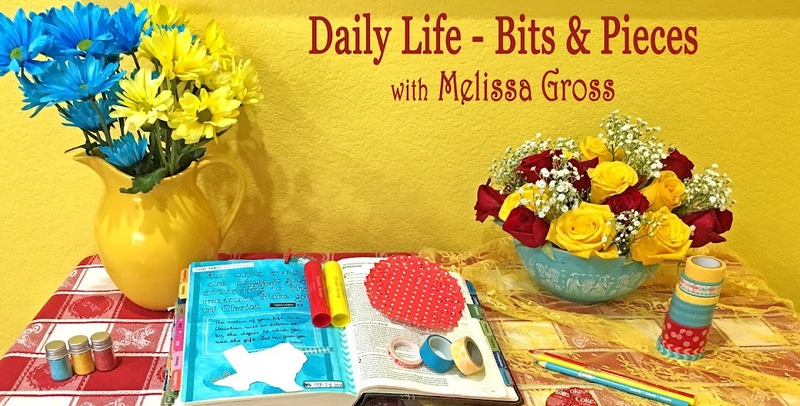 My Craft Channel is brand new this month and another video that I really enjoyed was Ella Publishing's Your Life in Lists. Near the end of this video, Wendy & Angie share how to create a handmade book of lists. 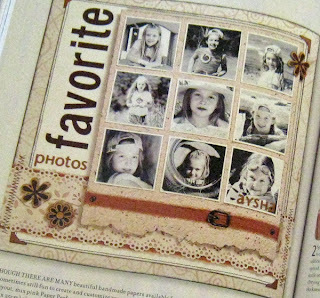 I especially like the one with eclectic pages, a great gift idea that can be personalized for anyone. 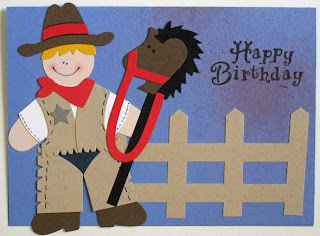 Noell Hyman is sharing a free video on Repurposing Stuff Into Scrapbooking as they celebrate Paperclipping's 5th birthday. I often use everyday items on my layouts, however there were several ideas in this video that I hadn't thought to try. I especially like the way she uses a clear bag like a transparency. 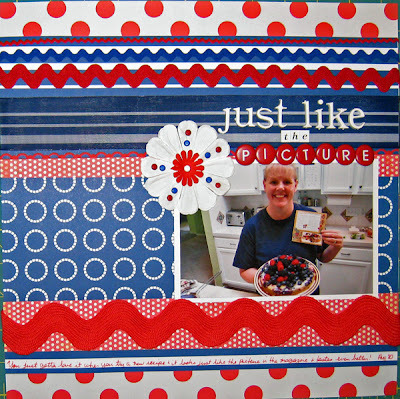 Each week Shimelle shares a sketch to layout video. I always enjoy watching her create a layout and hearing her explain the process and her reasons for choosing certain products and embellishments. Have you found any inspirating videos lately? If so, please leave a link in the comments so I can check them out. 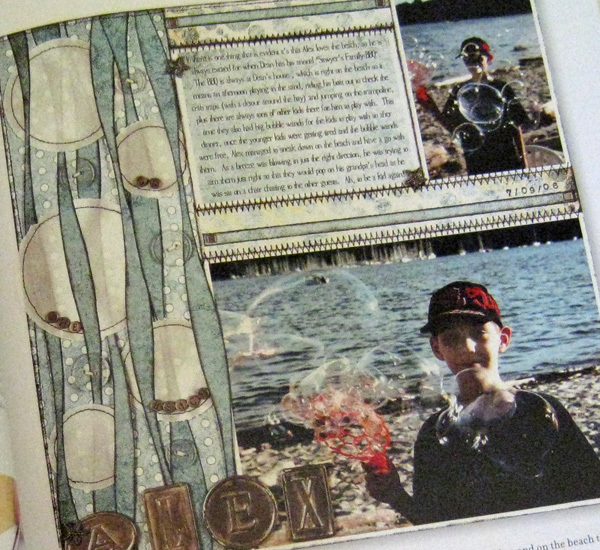 Overall I think the layout is a little busy with the small print on the patterned paper and so many journaling strips, but I'm thrilled to have this memory recorded for our Things That Matter album. 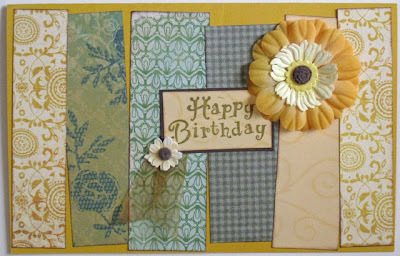 These first few days of the Pretty Paper Party have inspired me to use up some of my scraps creating cards. I also flipped through my embellishment notebook and pulled out some older items to use. 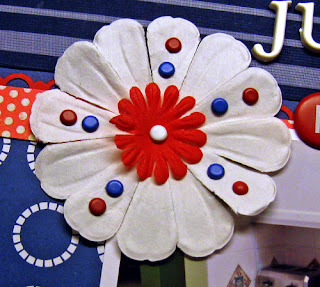 I made a list of the cards I needed to make for November and December and finished all seven of them, which means I accomplished my goal of handmaking all my cards for family & close friends throughout 2011! 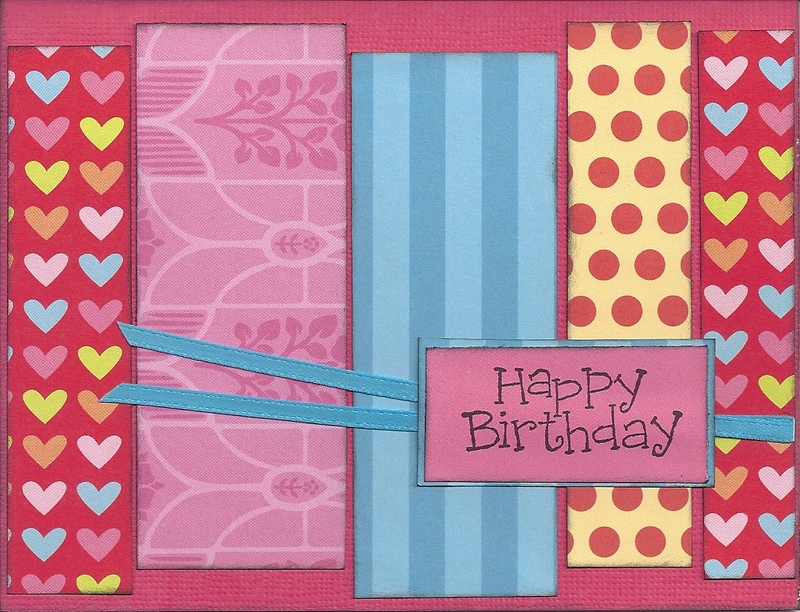 The first three cards were inspired by the Pretty Paper Party's prompt 1 card sketch and use strips of patterned paper, all from my scraps files. I had a 2005 Creative Memories mini-kit that included a few stickers, a journal box, and two small sheets of patterned paper. I used these items and Shimelle's card sketch from prompt 2 to create this next card. And finally I pulled out an old Paperkins Collectible Paper Doll (don't ask how long that's been in my stash!) for this last birthday card. 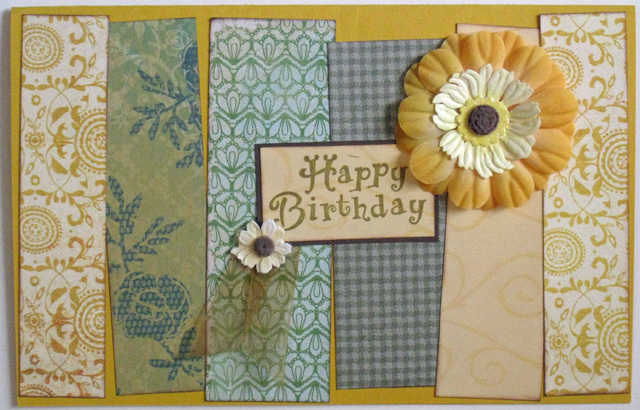 I had a piece of cardstock in my scraps that I had misted on and decided it would be perfect for the card base. I realize that's only five cards, but I'll have to wait until later to share the other two so the recipients don't see them ahead of time. I had a couple of questions after my paper stash post earlier this week that I wanted to answer here. 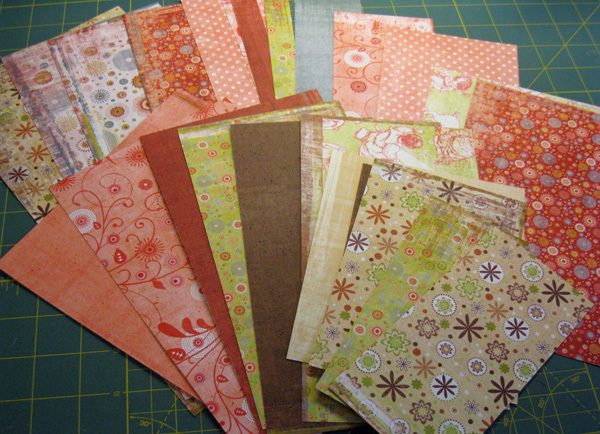 First, click here to read a previous post about how I store my scraps. I love having this basket of scraps right beside my chair, underneath my craft table. It is so convenient to grab the color I want and find that little extra piece of paper I need to complete a layout or card. The second question was about how I determine where to put my patterned paper, in the drawers where my papers are sorted by color or in my accordion file for speciality papers. In general, most patterned papers go in my color drawers. 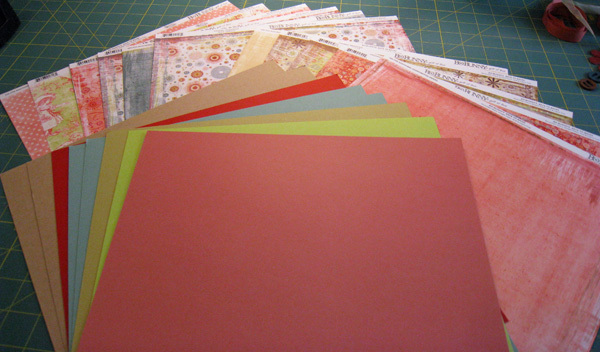 The accordion file holds new papers (for a little while - if I don't use them soon, they go in the color drawer), die cut papers, vellum, double-sided patterned papers and embossed papers. 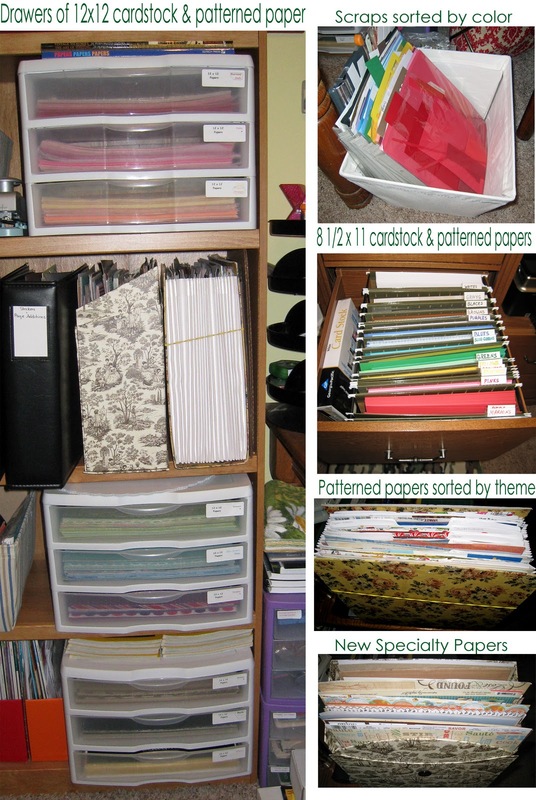 Eventually if any paper is not used, I'll clean out the accordion file and add it to my color drawers. I'm so excited to have all my cards made and will be focusing on using some pretty paper on layouts the next couple of days. I've noticed many of you joining me at the Pretty Paper Party - are you enjoying using up some scraps and pretty paper? Nic Howard & May Flaum really outdid themselves with inspiration in the BPC Double Take workshop which ends this week - sixteen double page sketches with two sample layouts for each, plus inspirational emails with eight additional sample layouts! I'm pleased that I was able to create nine double-page layouts over the past four weeks, eight with sketches from the workshop and one of my own creation. For my layout using sketch 3 from week 3, I started with some really old papers that I didn't like very much. I believe these papers came from a book of travel themed papers and have been in my stash for at least five years. 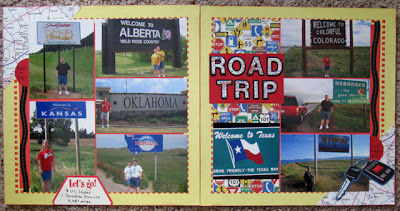 Even though I created a photo book for our Banff road trip last year, I wanted a layout for our Places We've Been album to document the 8 states & 1 Canadian province we visited. 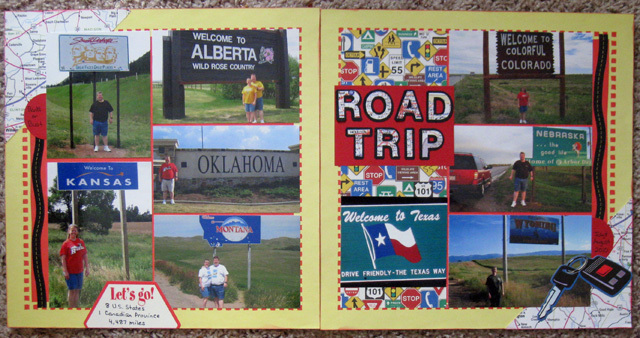 I started by covering the corners of my background paper with a map paper, then used the red squares as my photo blocks. I also finally used these great die cut letters I bought a few years ago before I had a Cricut to cut my own letters. 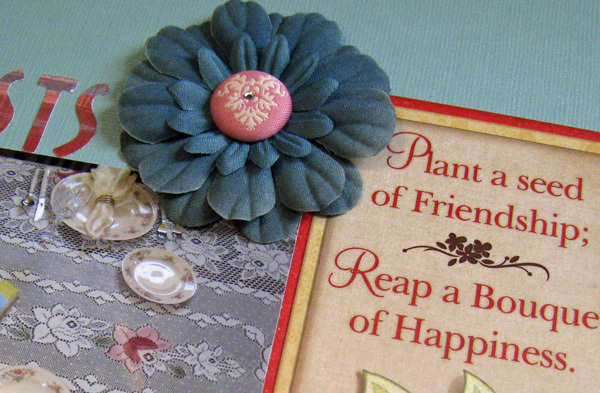 And I added this fun key embellishment that I took off a pre-made page I will never use. A couple of months ago, we bought Robbie a new car and traded in the PT Crusier we bought new back in 2003. I knew I wanted to create a layout about the Cruiser, and sketch 1 from week 4 was perfect for it. For 8 ½ years you have been a part of our family, mostly taking Robbie back and forth to work and school. We were so excited when you joined the family in January of 2003 with your six CD changer, eggplant purple color, and shiny chrome package. After a year, you and Robbie were in that little accident and your front end was crunched, but with some expert repairs and a new coat of paint you looked and acted as good as new. Since Melissa got a little car sick on long drives in your not-so-comfortable front seats, I’m sure you were often lonely as we rarely took you on any road trips, always preferring the much roomier Expedition. You did get to travel all the way from Rockwall to Groves that first year, and you finally got to leave the state of Texas when we loaned you to Daddy for his high school reunion in the summer of 2010. You were a welcome refuge for Robbie during all those lunch breaks in between his classes at SFA. However, this last year or so has been hard on you as you’ve made numerous trips to the repair shop, even having to be towed in a few times because you refused to start. Here we are in August of 2011, it’s time to say “Goodbye” . 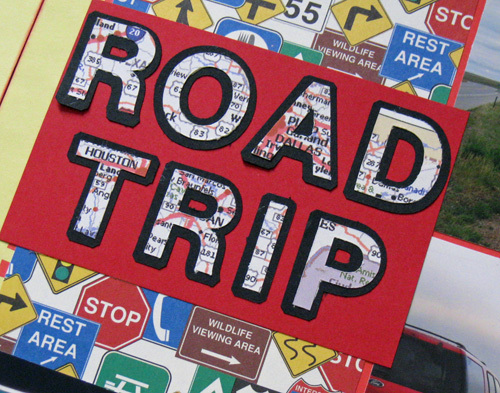 . . yet we’ll always cherish the 87,000 miles of memories you traveled. I've printed out all the sketches from the Double Take workshop to add to my inspiration file. I know I'll be returning to these over the next several weeks to create more double page layouts, but for now I need to take a few days to make some cards. 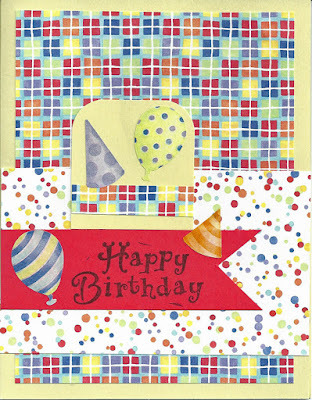 Luckily Shimelle's Pretty Paper Party prompts so far have provided a sample card and sketch each day! 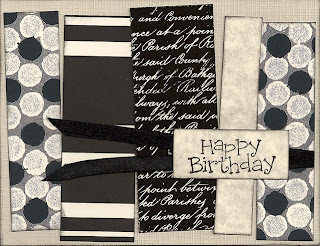 The ever creative Shimelle has a new class starting today - a four week party celebrating pretty paper! 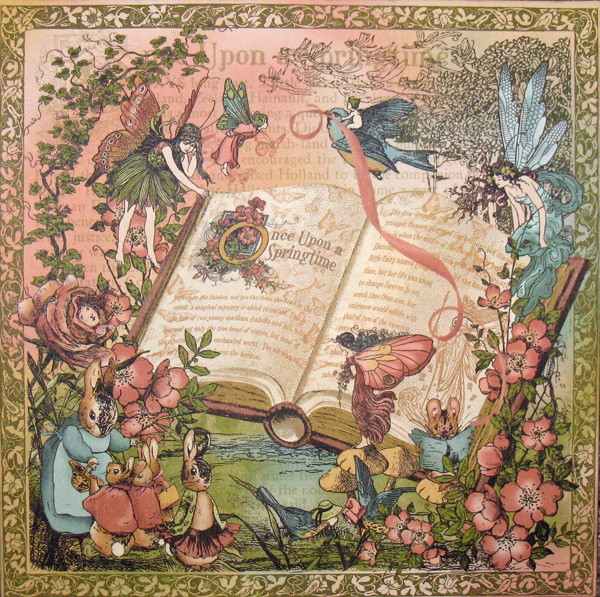 Our first challenge for the Pretty Paper Party is to take a photo of our paper. So, to get the party going, here's a look at my paper stash. By some standards, mine is a small stash and by others it would be considered a rather large supply of paper. I have most of my 12x12 cardstock & patterned papers sorted by color & placed in drawers on the shelves right beside my craft table. I have two accordian files - one holds new specialty papers and the other holds themed papers. I keep my 8 1/2 x 11 papers in a file drawer sorted by color & my scraps are sorted by color in a bin right under my craft table. This system works well for me, and I am looking forward to using some of these pretty papers over the next four weeks as I receive Shimelle's daily prompts and inspiration. Have you missed me? It's been very busy around here - all good stuff, but very busy. I thought I'd catch y'all up on what's happening around here and what you can expect to see on my blog in the coming days. 1. Teaching two Bible study sessions a week keeps me on my toes. There are a total of 25 ladies in the sessions, and I maintain weekly contact with them through emails and phone calls in between our meetings. We are having a great time studying the books of I, II, & III John. 2. This weekend our church held its annual Ladies' Retreat. As I am on our Ladies' Ministry Leadership Team, I was involved in the entire planning process and spent the week preparing some last minute items (preparing name badges, assembling craft bags, gathering a few decorations, packaging small gifts) and during the two day retreat I was extremely busy. 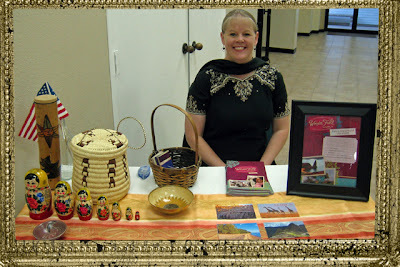 I was privileged to help set up, to man the registration table, to be a prayer partner, to assist the other leaders during their sessions, to place items for each session on the tables, etc, etc . . . and to help clean up! 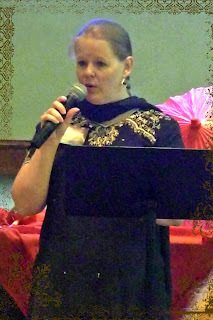 The retreat was a Wonder Full World, so each session centered around a continent. 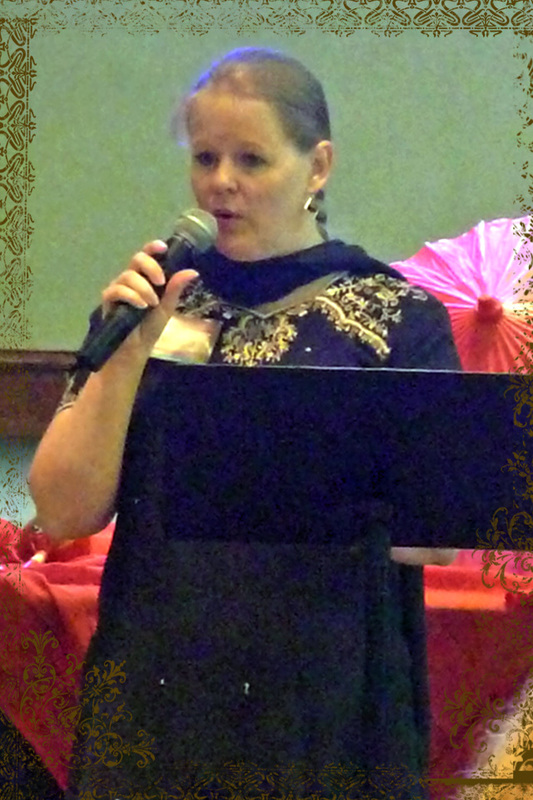 I was the speaker for the Asia session, so I wore an outfit that a friend had brought me from India a few years ago. The session focused on how we matter to God and how he is always with us, even in the largest crowds like those in Asia. 3. 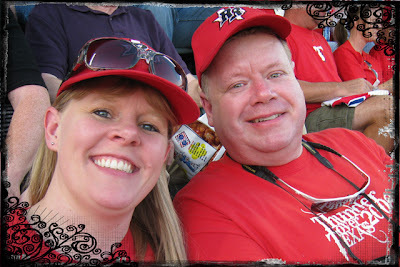 Robbie and I were excited to attend a Texas Rangers game during the playoff series with Tampa Bay a few weeks ago, and we have been enjoying watching this past week's games on TV as they secured a spot in the World Series! 4. This week we will be having the new glass frameless shower enclosure installed in the master bathroom, so I'll be sharing the before & after renovation photos soon. 5. I've got a few more layouts planned with sketches from the BPC Double Take workshop and hope to share those with you in the coming week. 6. I'll also be sharing about two new classes starting this week - Shimelle's Pretty Paper Party and the BPC Giving Well workshop. 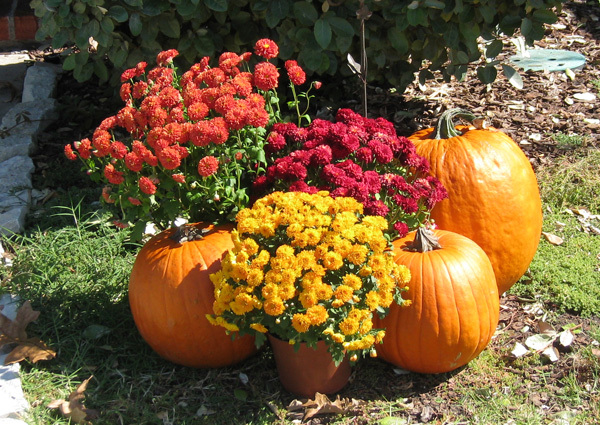 I can hardly believe that October is already halfway gone . . . and we are only 70 days away from Christmas! 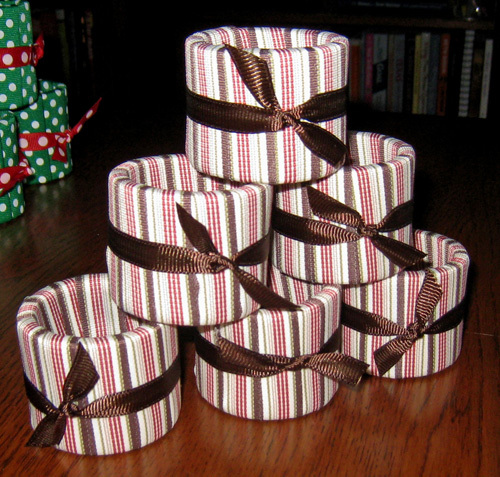 I have decided to make several of my gifts this year, so I better get started on those soon. 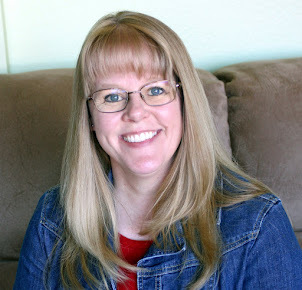 As soon as I've published this post, I'm off for a nice long browse through blogland as I haven't had much time to catch up on what y'all are doing lately. I'll be around to see you soon.